Fake imagery of a world upside down 2009 (Ultrachrome colour jet ink print, 36.8” x 60”) Courtesy of the artist and Jack Shainman Gallery, NYC. Pascal Grandmaison was born in 1975 and lives and works in Montreal, Canada. Working in photography, film, projection and installation, Grandmaison presents images that contemplate the limits of perception. 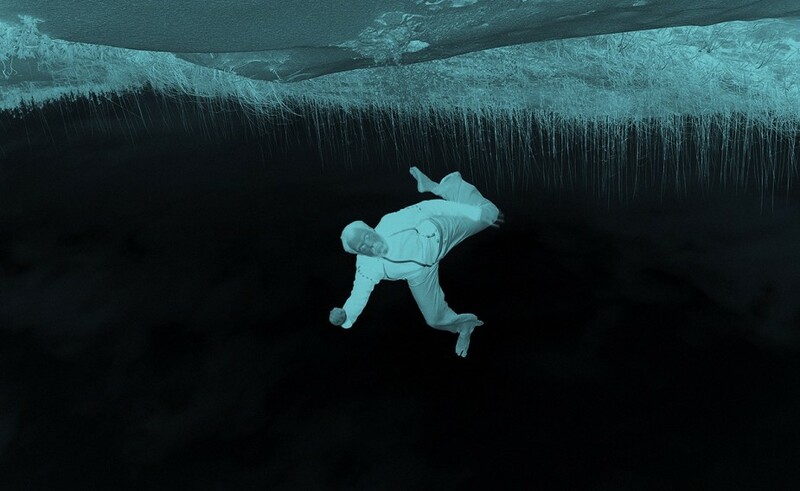 Fake Imagery of a World Upside Down (2009) is one of several works by Grandmaison which have stemmed from his fascination with the book Moon Rocks (Henry S.F. Cooper, 1970); an account of how specimens taken from the moon’s surface are gathered, stored and analysed. For Grandmaison, the moon represents both the natural and the paranormal: the tangible rock being the scientific actuality of its existence whereas its supernatural associations suggest a surreal universe with different laws of gravity. Employing apparently simple strategies of photo-trickery, Grandmaison presents a figure tumbling through an inverted landscape towards an upended sky. A further flip of light and darkness creates a negative, spectral space – an area of limbo through which the figure falls. Grandmaison’s ‘fakery’ explores our perception and acceptance of the invisible forces of nature, and the relationship between the world and the photographic image.